Writer Gerry Duggan (DEADPOOL) kicks off a shocking new direction for the Hulk! Iron Man saved Bruce Banner's life, but at a strange price. Who or what is Doc Green, aka the Omega Hulk? And why is he targeting - and 'curing' - the Hulk's Gamma-powered extended family? Rick Jones is the first to face the sinister Doc, but he might not survive his prescription! Next, Doc Green takes on Skaar - but when someone else intercedes in the battle, all hell breaks loose! And don't think the Doc has forgotten about the Gamma Corps and Red She-Hulk! But when it comes time for Red Hulk to take his medicine, there'll be mass smashing and widespread destruction! Guest-starring Kitty Pryde and Daredevil! And oh yeah -who shot Bruce Banner to begin with? Plus: Someone close to HULK dies! What impact will this have on one of the most dangerous super beings on the planet? 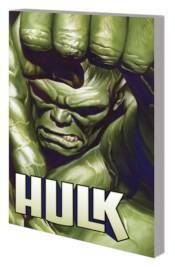 Collecting HULK (2014) #5-10 and ANNUAL #1.